Boxing Day…much has been said of it. The most depressing day of the year, after all it’s a whole year until Christmas Day, the turkey sandwiches pile up, broken toys and games you’re already bored of, crushing hangovers and the feeling you’ve over-indulged and don’t forget the sales! Ah yes the sales, a custom in its own right. I try to avoid them…after all you’ve spent so much over Christmas, why spend more? 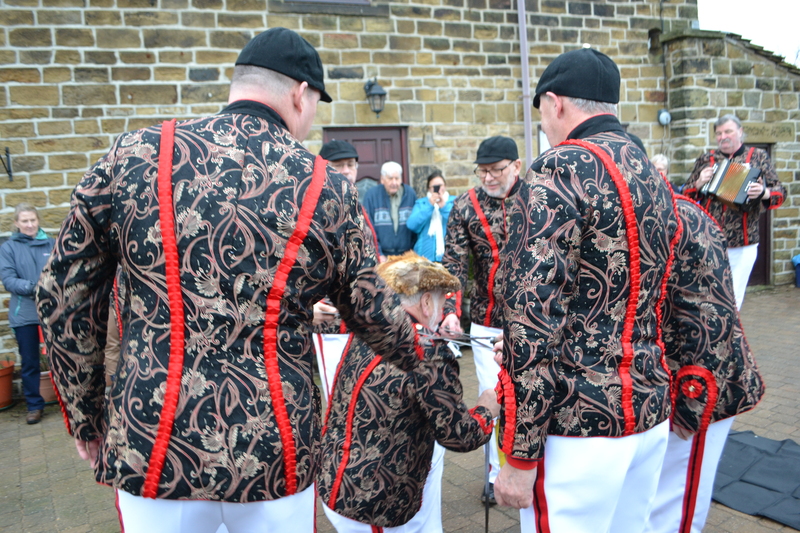 However, one year I convinced my wife to visit the shrine of Northern consumerism Meadowhall…so I could see the Handsworth Sword Dancers. 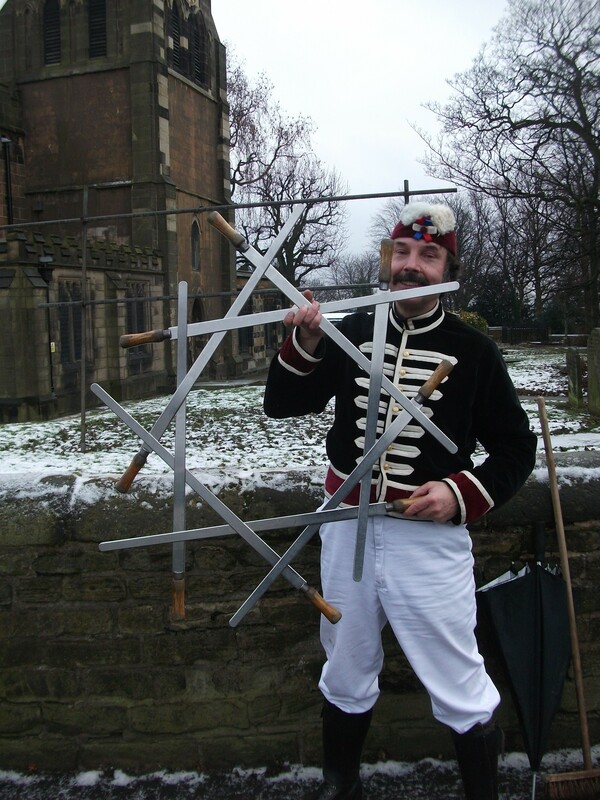 The Handsworth team are one of a select few of surviving long sword dancers. First reported in the late 1800s and despite the name originally they came from Woodhouse. This earliest notice appears to have been made by a local clergyman recanting seeing them dance in the 1870s when he was a boy. It was in 1880 when most of its members were from Handsworth that the move was made. In 1913, the famous folk dance enthusiast and Morris dancing revivalist Cecil Sharp visited and documented the group and they producing recall how they are one of the few groups which have survived the years since. Fortunately, unlike other teams which fell into abeyance or died out during the wars, being miners they were never called up for the First nor Second World War and unlike other customs it survived unbroken during this period. However, this is not to say the subsequent periods were not problematic, aging members (a common theme), a lack of permanent musicians, were among the reasons why the custom was sporadically kept up in the intervening year. Yet the team survived and by 1963 they became revitalised and it was then that they decided to formalise their custom. 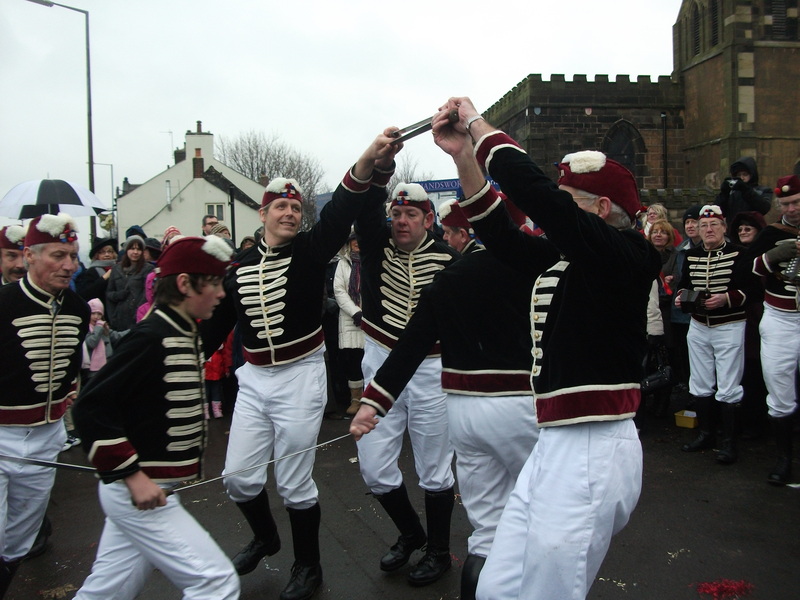 It was decided that rather than go out over the December period the event was firmly fixed to Boxing Day. This rather freeform nature has changed over the years and the dance has become more regimented but no less hypnotic in its nature. I arrived at their dancing arena, which although traditionally was located in front of their parish church, it’s clear that over the intervening years, what may have been a picturesque location has been ruined by the dual carriage way behind to such an effect I wonder what the non –locals hurtling along this carriage way make of the dancers and their large group of bystanders. It was very cold and snow had settled slightly in areas and I was concerned that the ground may have been a bit too slippery…but I was reassured that its gone come what weather. In come the clowns….and out again! What is an enjoyable aspect of this team, compared to other similar events is that by attending we can celebrate three customs in one. 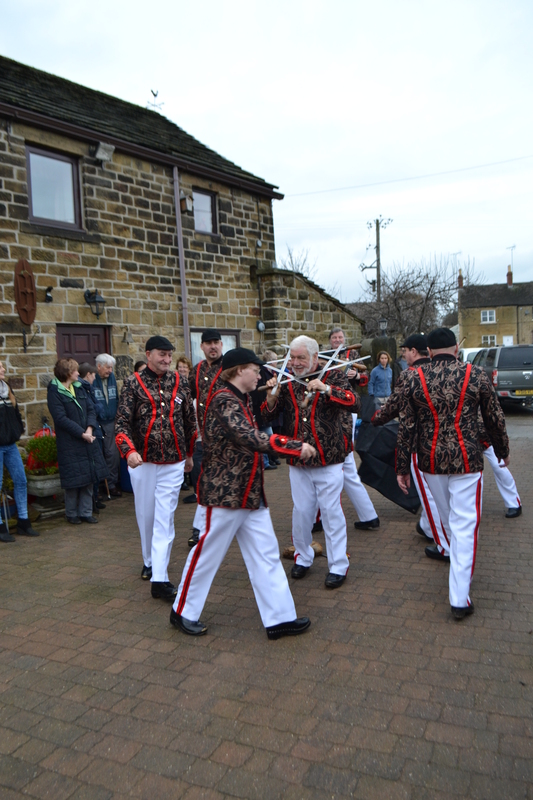 Firstly there is the dance, there is a small break of some traditional Yorkshire Carols, at the time my first confused exposure to them..why were they singing different words? 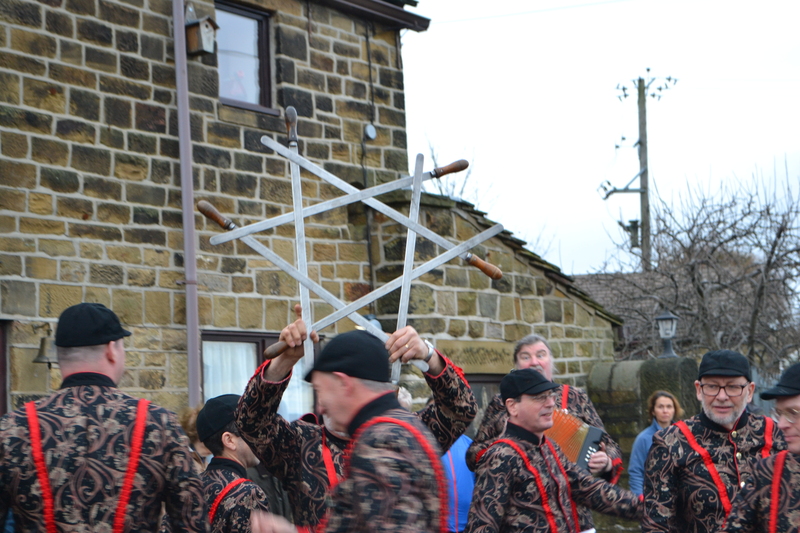 The other main aspect is the ‘mummer’s play’ this is a major attraction to the custom junkie and it usually rotates between two local plays: the Derby Tup and the Poor Owd Oss as below. 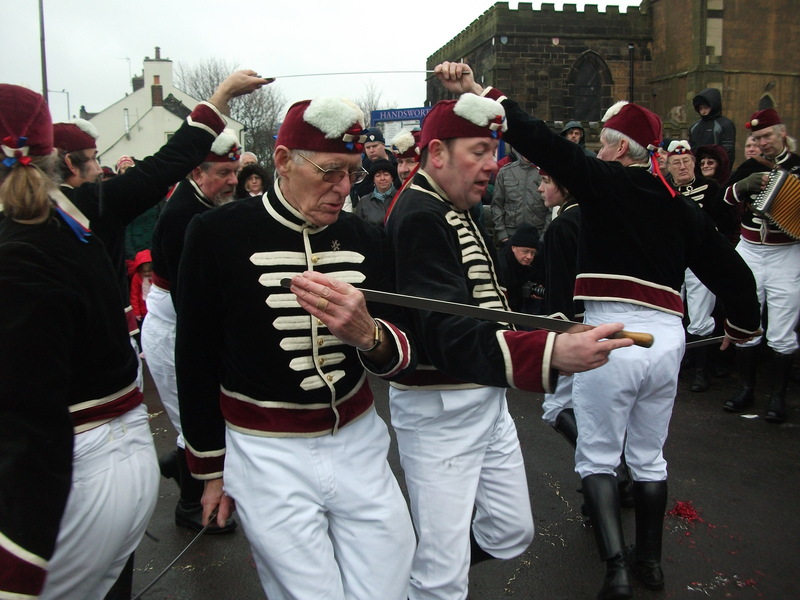 When I visited there was a rendition of the Poor Owd Oss and a number of the group were dressed up as horse and riders. Their rendition was interesting and very amusing but didn’t appear to resemble that done elsewhere. The play appeared to be done a differently dressed group. These I presumed were the clowns. These clowns were a regular feature of the team and their role appears to be to entertain the crowds during the dance, or probably between them, collect money and even get involved in the dance such as the lock. They were revived in the 1970s and were used to start the dance and clear the area with usual clown frivolity. The clowns appear now to be in the interludes, the plays and disappear or revert to dancers during the dancing part. The striking thing about the Handsworth team is their uniforms which are based on a Hussars and suggest a military origin for the custom which seems likely of course, or otherwise it was done to make the group look more official. The swords of course are not real swords but long strips of metal attached to a hilt. One wonders whether there did work with real swords. They’ve survived since it appears. It’s such a shame I don’t live nearer as I fancy giving it a go!